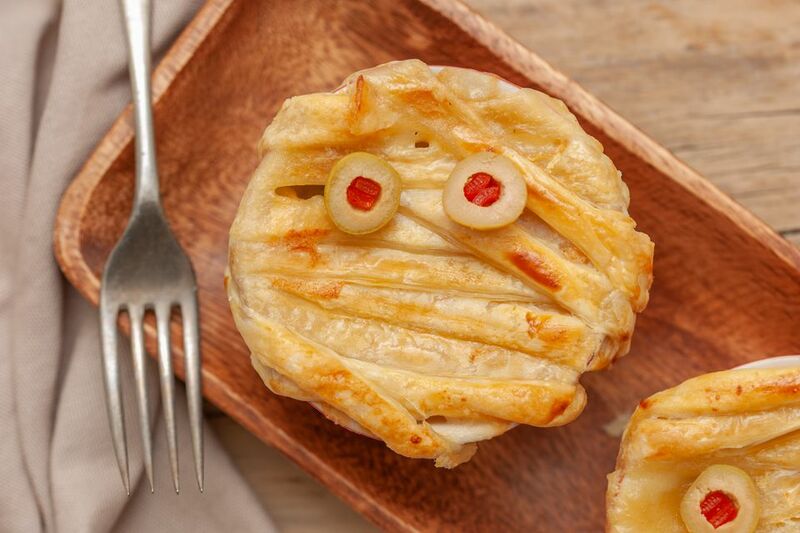 Kids love anything little—and these individual pot pies take the cake for Halloween cuteness. The mini chicken pot pies have strips of puff pastry on top to look like mummy wrappings and a few stuffed green olives slices make the perfect "eyes." Use a combination of frozen vegetables or any leftovers you're looking to use up—feel free to substitute broccoli florets for the baby peas, or use some sliced zucchini or yellow squash. You can make them any other time of the year too. Just use a solid round of puff pastry. Cut some slits in the pastry for venting, and bake as directed. Serve these cute and tasty little pies with a green salad tossed with sliced pears and a sweet-tart dressing. This recipe will give your kids a nice solid foundation before they venture out into the spooky night in search of swee treats. Preheat the oven to 400 F. Spray eight 6- to 8-ounce ovenproof individual baking dishes or ramekins with nonstick cooking spray and set aside. Add the onion and garlic; cook and stir for 4 to 5 minutes or until tender. Add the sliced carrots; cook and stir for another 3 minutes. Then, add the frozen peas and frozen hash brown potatoes; cook and stir for another few minutes or until the vegetables start to defrost. Stir in the chicken, alfredo sauce, and milk. Bring this mixture to a boil. Simmer, stirring occasionally, for 5 to 10 minutes longer or until all of the ingredients are hot. Stir in the cheese and remove the pan from the heat. Divide the chicken filling among the prepared baking dishes. Carefully unfold the puff pastry. Cut the pastry in half, then slice the pastry into 1/2-inch strips and place them on top of the filling, pressing the strips to the edges of the baking dish so they stick. In a small bowl, beat the egg yolk and milk. Brush this mixture carefully over the pastry. Put the dishes on a sturdy cookie sheet and place in the oven. Bake for 30 to 40 minutes or until the pastry is golden brown and the filling is bubbly. Put the green olives on the pastry for the eyes and serve. Be careful when eating this; the filing is very hot. Tell your guests to make holes in the pastry and wait for a few minutes before digging in.